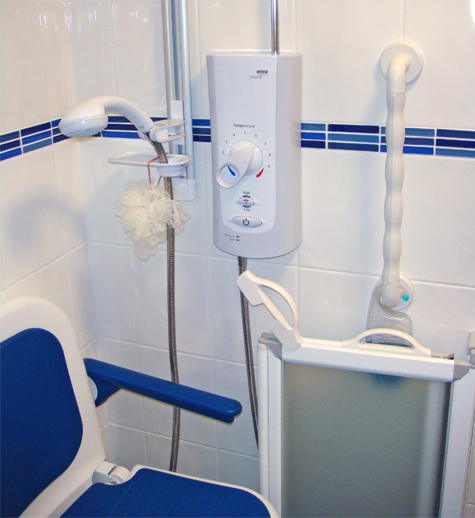 GOZNA Services – bathroom, installations, conversions and adaptations especially for the disabled. Whatever size your bathroom, we’ll make it a more stylish and relaxing room for all who use it. When you walk into a home bathroom with disabled facilities you are more often than not confronted by bulky institutional fittings that dominate the room. It ain’t necessarily so! The bathroom should be a haven of peace and relaxation and Gozna Services has the solution. Using quality products made by AKW – the UK’s leading manufacturer of bathroom ware – we will create your easy-to-live-in bathroom with stunningly designed units to give your bathroom a hotel-style look. Gozna Services offers a number of different kinds of bathroom adaptation. Restricted mobility, whether caused by injury or advancing years is frustrating; it all too often leads to a lack of independence and, above all, a fear of slipping. This means that many people are unable to enjoy their bathroom. Stepping into a conventional bath on your own can be a daunting prospect. Bath time is no longer a private activity. There is a straightforward solution to restore independence: by removing the bath we can usually install a level-access shower with appropriate hand-support. Most importantly, we do it on time! We provide a guaranteed completion date. We will meet you to find out exactly what you need. You may already have an idea of what you would like, in which case we can make your vision a reality. • level-access shower trays, sanitary ware and any other specialist equipment will then be fitted. … finally, we seal everything and decorate any new or disturbed areas. Then we show you how everything works and leave you to enjoy the independence of your newly adapted bathroom. Buildings: In working for Devon County Council, Mike Gozna says, “we have worked on almost every public building in Exeter”. Here is but a small selection.